The Oregon Clinic continuously strives to improve our service to accommodate the needs of our patients. Please tell us about your experience with our staff, physicians and/or website. This form is used for feedback related to your experience with The Oregon Clinic and is NOT intended to be used for medical emergencies, appointment requests, prescription refills, or to communicate health-related information with your physician or physician's office. Please contact your physician's office directly if you have these types of questions. Concerned with the Quality of Your Care? If you are a patient who would like help facilitating conversation and coordination in the process of resolving concerns or a patient care issue, please call 503-935-8000 Monday-Friday from 8:00 am-4:30 pm or use our feedback form to be connected to the appropriate person who can help you. We make every effort to respond in a timely manner. Learn more about our patient relations and how to address your concerns with the quality of care. 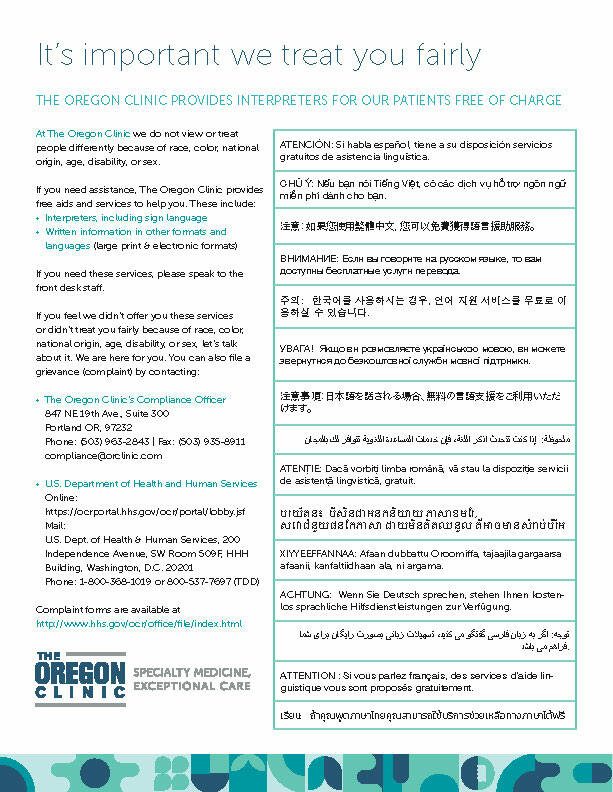 The Oregon Clinic provides interpreters for our patients free of charge. Click the image below to view our promise to our patients.